As baby boomers nearing, or in the retirement years, it is time to begin shifting investments, IRAs, 401Ks, etc. into income to replace your working paycheck(s). Income maximization is a specialized area of expertise, best provided by an RICP®, Retirement Income Certified Professional, specially trained in that pursuit. Conservative, guaranteed income annuity strategies are used to fill any income gaps that remain after maximizing social security and other sources of retirement income. *These strategies can lock in and provide income payments for life, whether the intention is to meet and guarantee minimum levels of lifestyle or something more. Once we have put a plan in place utilizing these income solutions, we look to the low-risk, low-volatility money management solutions provided through our strategic partners for additional growth of your retirement assets. * Fixed-indexed annuities are subject to various charges and expenses which you should be familiar with. All guarantees are dependent on the insurance company’s financial strength and claims paying ability. 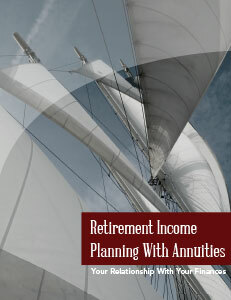 Fill out the form below to receive your complimentary Retirement Income Planning with Annuities Brochure.